Bleep*Star: Keyfax - all the keyboards you can't afford. Who else remembers this book? 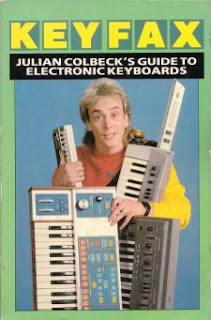 First published in 1985, later revisions had much less scary pictures of Julian on the cover. My copy is much loved and well thumbed - I knew it almost off by heart. I was the world's greatest expert on synthesisers I could sadly never afford. I'll do some research on all these machines for you - as well as work my way through a stack of 'Electronics and Music Maker' I found in the loft. Ah, sweet nostalgia!